Hear me out. While typos and grammar issues are inevitable in the absence of editing, there is a subtle way to use this as a lens into your thinking. I view tweets as atomic units. Immutable snapshots about your life that you can thread together with others over time. Twitter threads with other users are gold mines of insight. But, there is untapped value in longitudinal threads—over time—with yourself1. The lack of editing gives you the opportunity to posit something, sit with it, and revisit your stance at a later point2. If Twitter allowed editing with a revision history, the history would likely be tucked away in a submenu3, squandering its usefulness. The deltas revealed through threads gives us a peek into our thought processes, instead of focusing on editing a single, polished snapshot in-place. Nikhil Krishnan’s tweets embody this approach. Below are some of his truncated threads4 (along with a personal example). Remember, what’s important here is that these threads evolve over time and aren’t simply one-time bursts. I’ve experimented with extending this approach to my (incomplete) collection of personal documents. 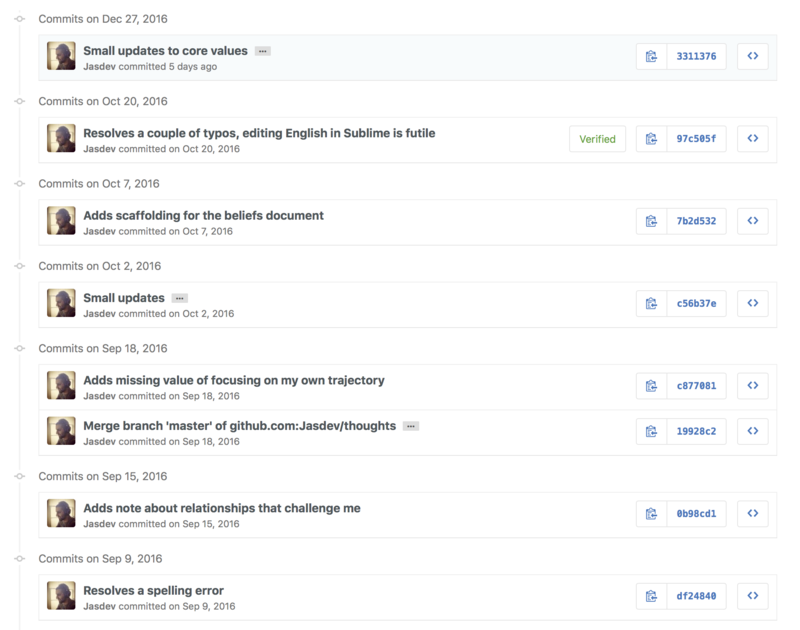 By keeping an enumerated core values list, daily list, and beliefs under version control, I can reflect on when and how they changed. The ability to edit in-place would erase this history. Scoping out, there might be a deeper concept at play here. The revisiting of older tweets—through threads—almost mirrors what we do in our heads through a process known as memory reconsolidation. “Research has shown that every time we recall a memory, it undergoes reconsolidation, meaning we are able to add new information or a different interpretation to our remembrance, even turning fearful memories into fearless ones5.” It’s almost as if these threads are a digital manifestation of reconsolidation. Through it, we can let go of previously strongly-held opinions, find holes in old arguments, and incorporate new learnings. ⇒ Mental noting in meditation serves as a good first step in the ability to reconsolidate more effectively. ⇒ I wonder if there would be value in authors including drafts of their work, when purchasing a book. Much like open source repositories with a full revision history, drafts could give us insight into their process. Here are some thoughts on this in the replies to a (deleted) tweet of mine.